This tab is used for managing the printed cheques of the organization. The system allows to search for printed cheques, print certified copies and create new cheques. From / Till Payable Amount Select the amount frame of the required cheques. 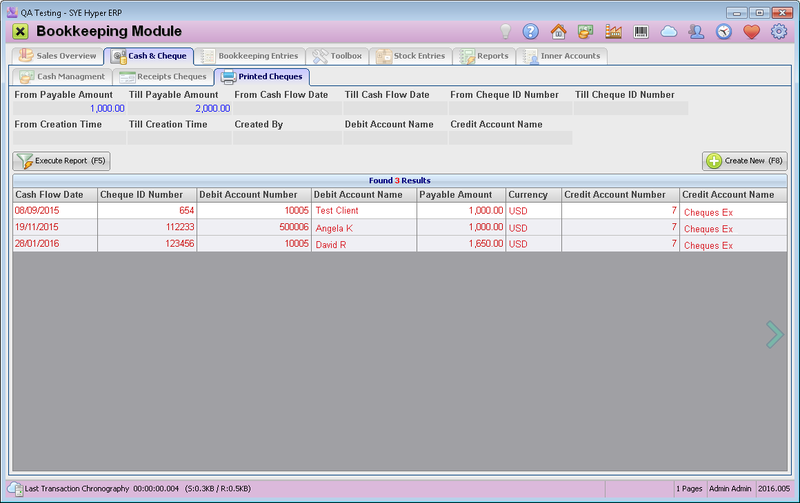 From / Till Cashable Date Select the cashable date frame of the required cheques. From / Till Cheque ID Number Display the cheques according to required cheques ID number. From / Till Creation Time Choose the creation time frame of the required cheques. Created By Select the user name of the required cheques creator. Debit / Credit Name Display cheques according to the selected Credit / Debit account name of the cheques. The results table displays all of the printed cheques, according to the filter fields values. Double click on a cheque record to display the Print Cheque window and the cheques details. This window also allows to print certified copy of the printed cheque. In order create and print new cheque, press the Create New button. This button will open the "Print Cheque" window where the user can create a new cheque, define its details, spread payments and print the cheques. For further information, click here. In order to print cheques, the Accounts Manager should define the "Payment Cheque Default Account" field in the Bookkeeping tab of the System Fundamentals. This account purpose should be defined as "Cheque Payments". To define the printed cheques as "Payable to Payee Only", Choose YES in this field, at the Bookkeeping tab of the System Fundamentals. This definition can be changed manually for each printed cheque in the Print Cheque window. Use the "Cheque Default A4 Format" field in the Bookkeeping tab of the System Fundamentals, to define the text align on the cheque, according to the local language. This definition can be changed manually for each printed cheque in the Print Cheque window.